Tragedy and heartbreak resulting from a past of horrific abuse may sound like the next bestselling fiction novel in a world of dramatic storytelling. But for Julia Legian, author of The Ugly Daughter, there is nothing imaginary about harrowing, life-changing subjects such as abuse at the hands of family members one trusts the most. Packed with a powerful message about finding your strengths and leaning on God to restore faith, The Ugly Daughter is a memoir readers will not be able to put down, and will remember long after they do. Tell us a little bit about yourself—Julia Legian, Author Extraordinaire! I was born in 1972 in South Vietnam, though truth be told nobody in my family really knows my real date of birth. During the war time I suppose people had other priorities than birth registries. My childhood was pretty tough, and that is the subject of my memoir The Ugly Daughter. In the early 80s my family managed to escape Vietnam as “boat people” and after a few years in a refugee camp, we immigrated to Australia, where I live till this day. I’m happily married to my husband, Simion and I have a wonderful son, Jeremy. Your latest book is autobiographical. Tell us about The Ugly Daughter. The Ugly Daughter is my memoir. 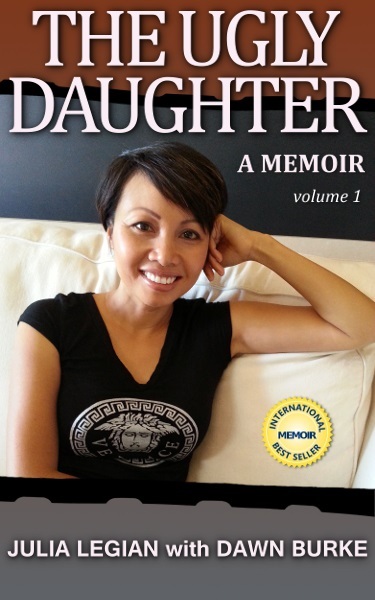 It covers the early years of my life from a young age till the time we escaped Vietnam and headed to Australia. I had what many would consider a horrific upbringing and despite all that, I managed to survive and become a successful person in my own right. I wrote the book to demonstrate that anything is possible as long as you have firm faith and believe in yourself. I also hope I can inspire and encourage others to persevere and better their lives. Why did you choose the genre you write in? I’m not a professional writer. I am just an ordinary person with an extraordinary story I’d like to share with the world in the hope of inspiring others. My writing style is brutally honest, simple and sincere and it’s written from my heart. What are your preferred routines to use while writing? I write at home in bed. The moment I wake up in the morning. I lie in bed and try to recall as many memories as I could. I have a notebook next to me and as soon as a new memory resurfaces I start to write it down. Later on during the day I go through my notes, sort them chronologically and refine the words until I am satisfied with the result. I have my favourite Buddha chill-out meditation music playing in the background to keep me calm and focused. What genre do you consider your book(s)? Definitely nonfiction; a memoir for women, I’d say. Did you learn anything in particular that stood out for you once you began writing your book? I learn the power of forgiveness, the power of letting go and to be compassionate towards the people that hurt me. I also the realization that I’m the only person that could free me from the prison of pain. And happiness is a personal decision and a personal choice and it has very little to do with our circumstances. Are there any books that have most influenced your life? The infamous question- what advice would you give to any aspiring and new authors out there? Do what you love. Work hard and never give up on your dream. What can we look forward from you in the future? The Ugly Daughter Part 2 is the follow up to my first novel. Where can readers find a plethora of information about Julia Legian online? http://www.theuglydaughter.com/ would be a good start.